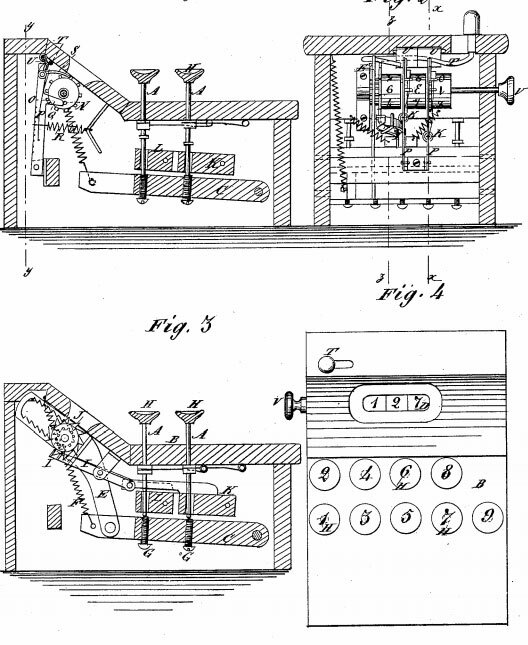 On May 2, 1876, David Carroll of Spring Creek, Pennsylvania, took out a US Patent №176833 (see the lower image of the patent drawing) for an adding-machine. The device obviously never went into production, and only the patent model survived to the present time (property of Smithsonian National Museum). 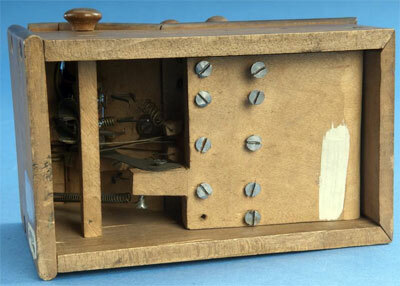 The machine is made of wood and metal, with measurements: 10.8 cm x 12 cm x 18 cm. 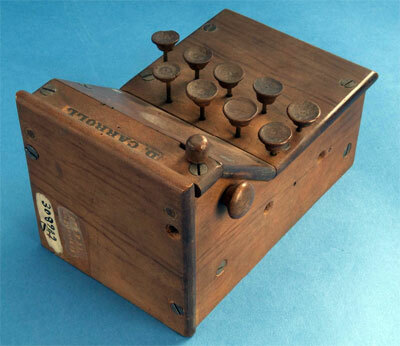 This device is a small nine-key 3 positional adding machine. It has a wooden case with nine metal keys with wooden key covers, arranged in two rows—2 4 6 8 (upper row) and 4 5 5 7 9. There are three wooden numeral wheels visible through a window at the top of the box. The machine is designed to add single digits up to 999. The effect of the keys is determined by the adjusting screws (marked with G on the patent drawing) on the underside of the machine. The keys are constructed as to length, so that when knobs (H) are pushed down to the top of the case, they turn the wheel the number of teeth, corresponding to the number of the key. The three registering wheels have on their left side a ring of ten equidistant pins, that are used in carrying. There is a lever at the top of the machine, that can be adjusted to release the number wheels, so that they can be turned back to zero using the turn-knob (V) on the left. There is a fixing mechanism provided, to prevent the main wheel from turning too far, when the keys are pressed. It consists of stop-pawl (I), which engages ratchet-wheel (J) at the moment the pawl (E) stops in the downward movement. So, who was the inventor—David Carroll? David Carroll was born on May 13, 1828, near Union City, Erie County, Pennsylvania, in the old homestead farm of William Carroll (1796-1882) and his wife Hannah Slawson-Carroll (1800-1873). David was the third child (of ten) in the family. David's grandfather, Ferdinand Carroll (1751-1831), immigrated to Union Township from Ireland in 1801, with his five sons and four daughters. The family and all their earthly possessions came to Union Township on horseback from Pittsburgh and they built their first small home from poles and called it "Castle Halsey." William, his youngest son, was to become David's father. David Carroll was a diligent schoolboy, always winning prizes. Mathematics was his best subject and he was always far ahead of his classmates. But despite his talent in mathematics, science was his favorite subject. David's interests in science and the mechanical aptitude, inherited from his father, led him into becoming an inventor. He could picture in his mind the dimensions of every separate piece of a machinery and how it would look put together. When he was still a boy he conducted perpetual motion studies. In the US census lists David Carroll is listed as carpenter (year 1850), farmer (1860 and 1870) and inventor (1880). David Carroll married to Elizabeth Coventry-Carroll (1832-1891). The family had 8 children—Ellen (b. 1855), Jennie Blanche (b. 1860), Rosannah (b. 1862), Etta (b. 1868), Freddie (b. 1870), Hannah (b. 1873), George (b. 1875) and Girta May (b. 1878). David Carroll is a holder of several other US patents, besides the above-mentioned one for the adding machine: №64628 from 1867 (reissued 1879) for a stump-extractor, №197995 and №303115 from 1884 for a ship's log, etc. However, David Carroll's most important invention was not the adding machine, interesting for us, but his Leway ship log, which proved to be invaluable to the steamships on the Great Lakes. In this time the purpose of a ship log was to fix the latitude and longitude of the ship at sea. Until modern technology developed instruments to do this, it was done in clear weather by observing the sun or stars, or by landmarks if the ship was near enough to shore. But bad weather created a serious navigational problem for ships. It caused ships to run slowly, increasing the danger of going onto reefs or rocks or drifting off course. David Carroll made his Leway ship log with two wheels, lowered down through a pipe in the vessel, reaching about four feet below the bottom of the ship. These wheels were connected with the indicator by wires. The indicator was on deck and had two dials, one for headway and the other for leeway of the drift. The dials had hands that pointed to the distance as clock hands point to the time. After a successful test of his log in 1880, the captain who tested the device was giving a big puff in the Chicago and Buffalo papers, but David had hard time trying to get the log manufactured. In December 1881, he moved his family to Sheffield, Ohio, in order to work in the lumber business and try to raise more funds to keep his family and his log. Neither historic nor contemporary logs have David Carroll's name on them, but his principles are still operating. Every time a Patent log, Chip log, Taffrail log, Forbes log or Pitometer log is operated by modern mariners, David's invention gains new momentum. David Carroll died on July 5, 1888, in Union City, Erie County, Pennsylvania.